Perfect for the person on your list who "has everything." 1. 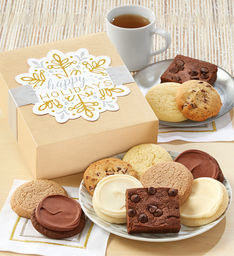 A sweet and salty gift box with the perfect combination of treats the giftee can share...but probably won't want to. The basket includes Moose Munch caramel popcorn, peanut butter pretzels, super party snack mix, raspberry galettes, two white chocolate raspberry cookie bars, and fruit bowl jelly beans. Get it from Harry & David for $39.99+ (also available in deluxe and grand options). The set includes one soap of your choice (lavender lemongrass, rosemary lemon mint, or tea tree lime almond), one lip balm of your choice (vanilla, peppermint, lavender, almond, tangerine, raspberry, piña colada, or coffee), a 4 oz grapefruit bath salt, a muscle rescue balm tin, and a skin rescue balm tin. 3. A basket that will be a big dill for someone on your list who is obsessed with pickles. The box includes pickled cherry tomatoes by Doux South, pickled Thai basil jalapeños by Gordy's Pickle Jar, spicy pickled okra by Pacific Pickle Works, jalapeño honey dills by The Real Dill, pickled peas and carrots by Unbound Pickling, Cajun pickled string beans by Unbound Pickling, and whiskey sour pickles by Brooklyn Brine. Get it from Mouth for $112.50. Psst...check out our full list of gifts for anyone who really love pickles. 4. 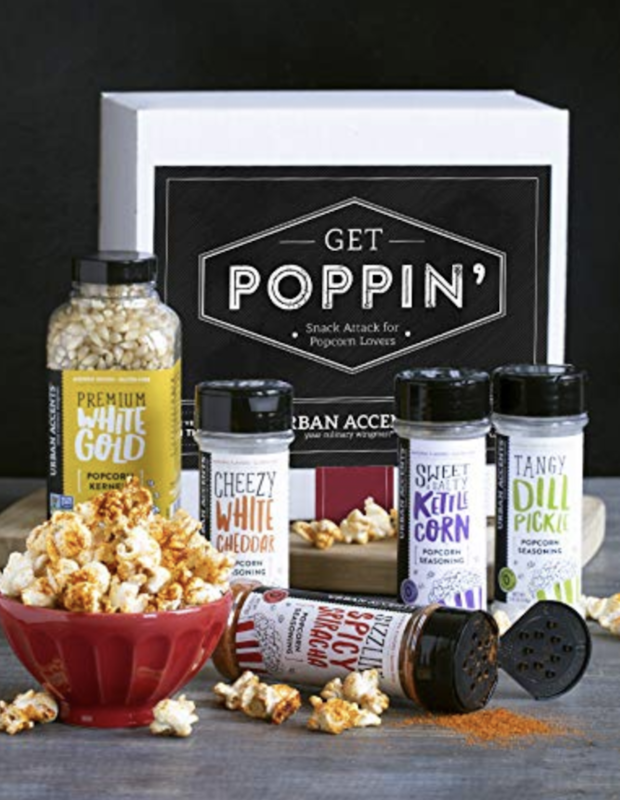 A Snack Attack gift set with popcorn kernels and flavoring that they'll like butter than anything else they get for the holidays. Get it from Amazon for $25 or a deluxe set with three different kernels and six flavorings from Amazon for $50. 5. A crate of caramel apples dipped in chocolate, because nobody buys nice caramel apples for themselves but everyone enjoys them and would be THRILLED to get them as a gift. When my cousin got married years ago, her and her husband gave out caramel apples as their wedding favor, and honestly, it was the best gift ever. This set includes a milk- and a dark-chocolate-covered caramel apple in an "Orchard Fresh" apple crate. Get it from Amazon for $36.95. 6. A breakfast box filled to the brim with scrumptious morning treats, guaranteed to make Christmas morning less hectic so everyone remembers to eat breakfast while they're opening presents. This basket includes cherry blossom English muffins, wild Maine blueberry English muffins, cranberry citrus mini English muffins, two apple cranberry scones, an orange cranberry loaf cake, strawberry preserves, Tiffin ground coffee, and a wooden spreader. Get it from Wolferman's for $39.99+ (also available in deluxe and grand). 7. A BBQ grill set they might not be able to use right now (if they live somewhere cold; if not, good for them!) but they will totally appreciate when they can head outside to grill some meat. It includes two gourmet BBQ sauces, a sauce pot, a basting brush, and a customizable branding iron. 8. A basket stuffed with so many types of popcorn I'm getting hungry just looking at it — I mean, cookie dough popcorn?!? Come on!! The basket includes cheese popcorn, butter popcorn, white cheddar popcorn, caramel corn, cranberry popcorn, dark chocolate sea salt caramel corn, toffee and sea aalt caramel corn, mint chocolate chip popcorn, holiday cookie dough popcorn, red and green sour stars, red, green and gold foil chocolates, and milk chocolate covered cherries. Get it from The Popcorn Factory for $82. 9. A food basket filled with pasta products because IT'S NOT ABOUT THE PASTA (but it totally is about the pasta because pasta is delicious). This basket includes extra-virgin olive oil, a moscato balsamic vinegar, two tomato sauce jars, and a bag of pasta made with ancient Italian grains. Get it from Amazon for $21.97+ (available in 13 variations). 10. A classic-favorites basket that will probably literally make the giftee exclaim "OMG" when they see how amazing the treats are inside. 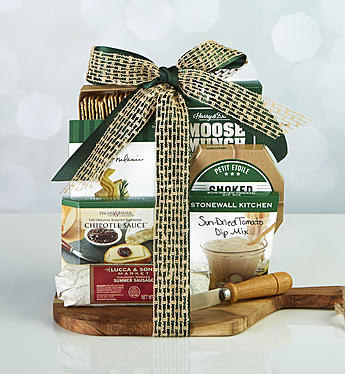 This basket is stuffed with six Royal Riviera Pears, Moose Munch milk chocolate popcorn, sharp white cheddar cheese, three-seed crackers, pepper and onion relish, milk chocolate-covered cherries, and signature chocolate truffles. Get it from Harry & David for $49.99+ (also available in deluxe and grand). 11. 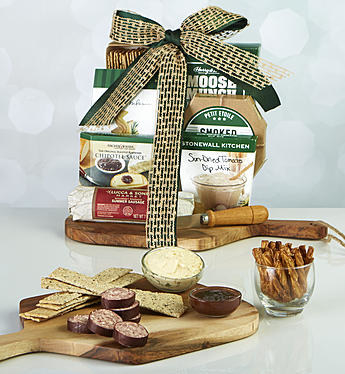 A cheese and crackers set that's quite the gouda gift, especially since the products are straight from the dairy state. Sorry, I'm from Wisconsin, so no matter how many "Happy cows come from California" commercials I see, I know it's not true. Wisconsin has the best cheese products, hands down. This basket includes two packages of cheddar cheese and one of pepper jack, plus three packages of smoked summer sausages in original, garlic, and jalapeño, water crackers, dipping pretzels, and mustard. 12. A holiday dog treats basket with both treats and toys because dogs (and their owners who are a bit obsessed with their pooch) deserve presents too! The basket includes peanut butter treats, yogurt-coated dog treat sticks, holiday dog bones, a holiday pig-shaped dog toy, a red-and-white striped plush ball dog toy, and endless kisses from the pooch*. *Okay, that's not technically included, but I'm sure it will be true. Look at how great the basket looks! Get it from 1-800-Baskets for $59.99. 13. A brunch and bubble gift basket so they can invite you over for brunch instead of waiting an hour or two to eat at that new hot place that just opened up. This basket includes Family Celebration coffee, hazelnut coffee, wild blueberry spread, hot pepper bacon jam, beef summer sausage, English breakfast tea, Earl Grey tea, lemon blueberry scone mix, honey, and a tea towel. Get it from Hickory Farms for $76 (with champagne) or $60 (without champagne). 14. A white rose and jasmine bath-and-body basket packaged in an adorable gold bathtub, because everyone needs more products to make their "me" time even better. The basket contains shower gel, bubble bath, body scrub, bath salt, six bath bombs, a rose-shaped bath pouf, and a cosmetics bag. 15. An entertainer basket stuffed with everything needed to throw a killer holiday party, no thought required! On top of a wood cutting board is a cheese knife, black pepper and sea salt flatbread, roasted raspberry chipotle sauce, Asiago cheese straws, garlic summer sausage, Moose Munch caramel popcorn, dipping pretzels, smoked gouda cheese spread, and a sun-dried-tomato dip mix. Get it from 1-800-Baskets for $69.99. 16. A chips and candies bundle for your snack-obsessed friend so they'll be stocked for months with all their favorites. The bundle has a variety of 40 individually wrapped single-serve snacks. Get it from Amazon for $19.95+ (available in four sizes). The tower (left) includes buttercream frosted holiday cookies, snack-size gourmet cookies, butter shortbread cookies, and sweet and salty pretzel clusters. Plus, you can add a customized holiday message for the recipient. The gift box (right) includes gluten-free fudge brownies, and chocolate chip, brownie walnut, snickerdoodle and buttercream frosted sugar cookies. 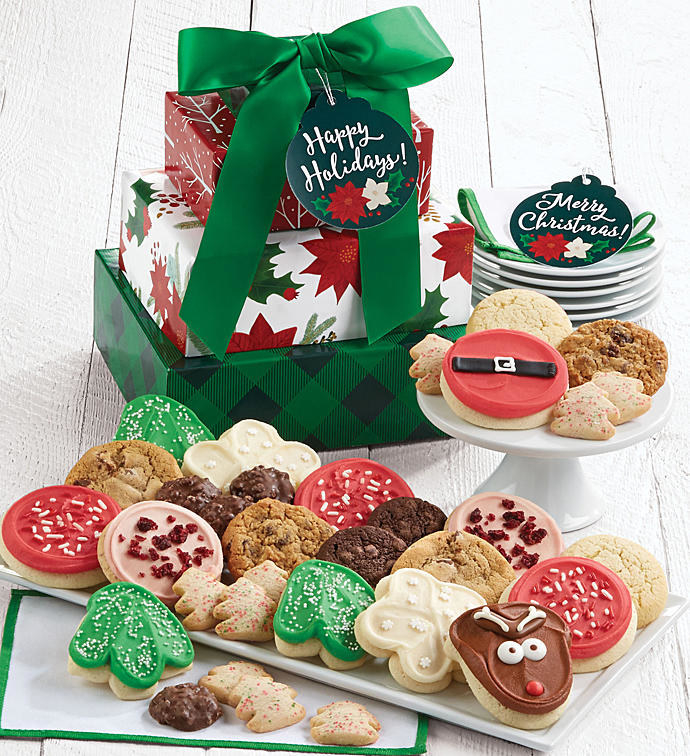 Get them from Cheryl's Cookies for $39.99 for the tower and $34.99 for the gluten-free box. 18. An around-the-world beer bucket for the person who finds it un-beer-able to see the world without tasting brews from different countries. The bucket includes a Hefeweussbier by Weihenstephaner, Pale Lager by Moosehead Brewer, Porter by Founders Brewing Co, Pale Lager by Red Stripe, Premium Bitter / ESB by Old speckled Hen, Pale Lager by Kirin Brewing Co, beef jerky, garlic sausage, Monterey Jack jalapeño cheese, sea salt and cracked peppercorn peanuts, snack mix, and sea salt and cracked pepper kettle corn. Get it from GormetGiftBaskets.com for $79.99. 19. A gift basket for the person in your life who always has hot sauce in their bag...swag. The set includes seven hot sauces of varying spiciness, including garlic herb, smokey bourbon, garlic pepper, chipotle pepper, cayenne pepper, whiskey habanero, and ghost pepper. Wow wow wow, does this look delicious. It includes an eight-piece assorted gift box, signature truffles box, a large milk chocolate bar, a small milk chocolate bar, a large dark chocolate bar, a bag of milk chocolate truffles, and a bag of dark chocolate lava cake truffles. Get it from Godiva for $59.95. 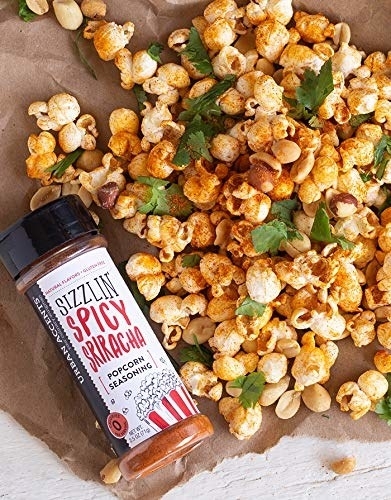 It includes seven varieties of nuts: roasted salted almonds, pistachios, cashews, raw walnuts, hot Cajun mix, honey-glazed peanuts, and honey-glazed pecans. 22. A Bloody Mary gift basket for anyone who considers bloodies to be in a drink league of their own, so they can make their own at home anytime. It includes all the ingredients for a delicious Bloody Mary, except for the vodka and tomato juice. You get Demitri's Bloody Mary Seasoning, Demitri's Bacon Rim Salt, cheddar snack mix, and Tabasco sauce. Get it from World Market for $39.95. 23. A basket filled with 27 different foods from The Swiss Colony that the recipient will probably be snacking on throughout the next year. It includes snack-sized original, caraway, and garlic summer sausages, cheddar, brick, and Colby cheeses, mixed nuts, fruit spreads, bonbons, cakes, petits fours, and more. 24. And a 12-coffee bundle for your caffeine-obsessed friend who will exclaim, "Where have you bean all my life?" when they open this. The bundle includes Italian roast, chocolate almond, French roast, crème brûlée, hazelnut, Irish cream, mild roast, cinnamon, dark roast, French vanilla, breakfast blend, and bistro blend. Get it from Walmart for $9.98.